Welcome back to yet another session of Consciousness Cooking. Session 4 will be held in Escondido Village Center, on Friday, October 19, 7:00 PM - 9:00 PM. Please use the Registration tab to book your spot. 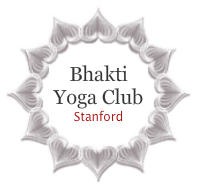 This Fall, the Bhakti Yoga Club @ Stanford is presenting a unique offer to its students, faculty and staff: Consciousness Cooking vegetarian cooking classes. Hands-on learning of the cuisine art and more. Parathas are Indian flatbread with spicy stuff inside. The stuff can be made with many different fillings. The most popular filling however are aloo or potatoes. Aloo parathas are perfect for breakfast or brunch. In northern parts of India they take them for dinner as well. Mix flour, oil, salt and water together to make soft dough (if the dough is hard, add a little more water). Knead the dough for a few minutes on a lightly greased surface to make smooth and pliable dough. Boil 2 medium potatoes with 2 cups of water. After the water comes to a boil, reduce the heat to medium. Let the potatoes cook until they are tender. After the potatoes are cold enough to handle, peel the skin off and mash the potatoes. Mix chilly, cilantro, cumin seeds and salt and amchur powder and garam masala to the mashed potatoes. Make uniform balls and divide in equal parts. Divide the dough and potato mixture into 6 equal parts. The potato balls should be almost the same size of the dough balls. Take the dough and spread with roller about 3 inch diameter. Now spread the dough with hands so that the circular ends of the dough are thin and middle part is little thick. Place the potato balls in the center. Seal by pulling the edges of the rolled dough together to make a ball. This way the thickness of the dough is uniform. Proceed to make all the balls. Let them settle for 3 to 4 minutes before rolling them. Heat the skillet (non-stick one) on medium high. Note: An iron skillet works best. To check if the skillet is hot enough, sprinkle a couple of drops of water on it. If the water sizzles right away, the skillet is ready. Roll the balls first in dry whole-wheat flour. Lightly press the ball on the sealed side and keep it on the topside when rolling. Slowly Roll the ball light handed in to 6-inch circles. 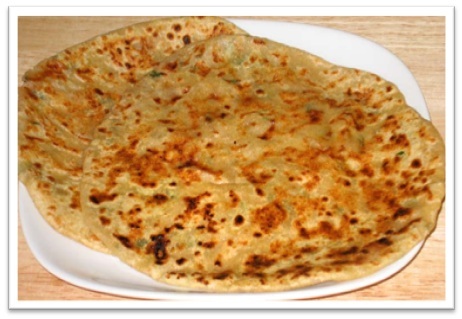 Whenever the dough sticks to the rolling pin or rolling surface, lightly sprinkle dry whole-wheat flour on both sides of the semi-rolled paratha. Then flip the paratha over. You should see some golden-brown spots on the topside. After a few seconds, spread 1 teaspoon of butter or oil on the paratha. Again, flip the paratha and lightly press the puffed areas with a spatula. Flip again and press with the spatula making sure the paratha is golden-brown on both sides. Remove the paratha and proceed to the next paratha. Our World:Time for a Positive Stage? You are invited to our special Event of this Fall! Don't miss this one. 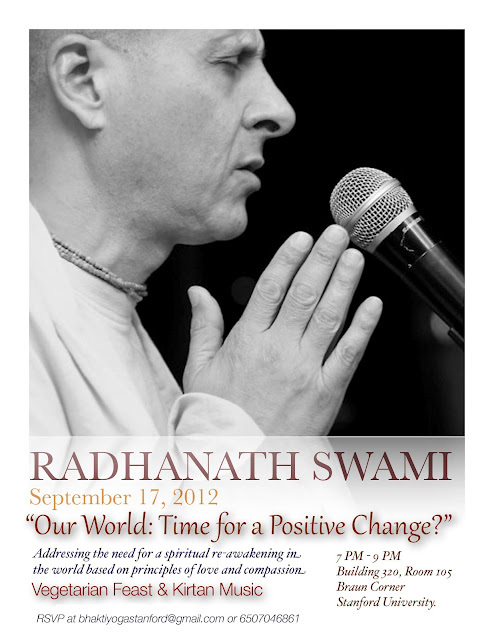 Please click here for more info on our distinguished speaker, Radhanath Swami, or to RSVP for the event! Session 2 was hosted by Rains Housing. Heat oil in a saucepan over moderate heat, sprinkle asafetida powder, Italian seasoning and add the celery. Sauté for 30 seconds. Add all the vegetables, stir fry for a while. Pour the tomato puree and add the parsley. Add the chickpeas, kidney beans, water, salt, pepper and chili flakes. 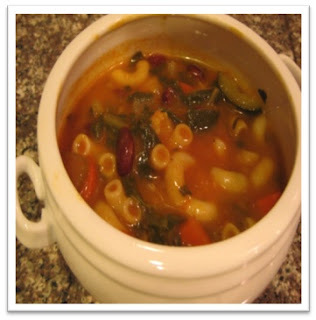 Cook covered partially over very low heat for 1½ hours (this soup tastes best when cooked slowly). If you want to cook fast add more water and cook on medium heat. It takes about half hour. Add the uncooked pasta and raise the heat to medium and cook until the pasta is tender. Reduce the heat again to very low and cook for another 8-10 minutes. Serve hot with toasted butter smeared slices of bread seasoned with dried oregano leaves. Thank you to all of you who joined us for the first session of this Fall's Consciousness Cooking class. We are sure all of us had good fun making and learning this easy yet tasty snack. Below is the recipe for everyone's reference. Until we meet again...adios! Blend everything to a smooth paste adding water (1/2 cup). This should be spicy (hot). Do not worry about the taste as this will be compensated by the sweet taste of tamarind chutney. In a heavy bottom pan add the tamarind water, dates, jaggery, cumin powder, chilli powder and salt. Bring this to boil and cook until the mixture becomes thick. Turn off the heat and allow the mixture to cool. Grind this to a smooth paste. • Take a dry big bowl. 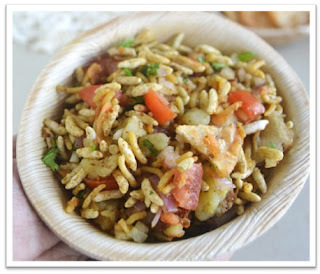 Add the puffed rice, green chillies (optional), cut potatos, raw mango, tomato together in a large bowl. • Add the Tamarind Chutney and coriander chutney as per your taste. • Mix well and garnish with coriander leaves and sev. Serve immediately. 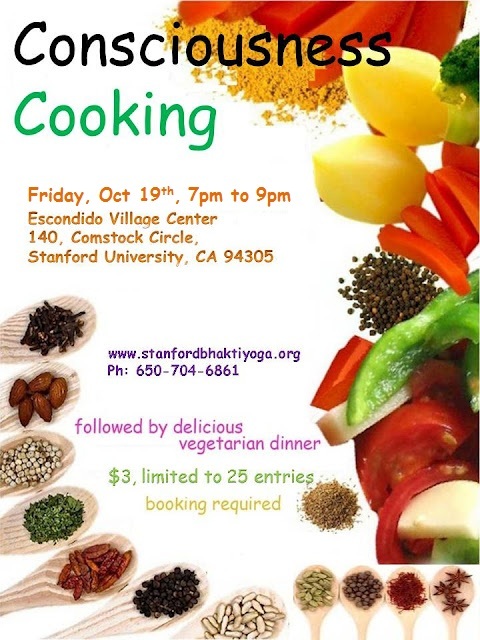 This Fall, the Bhakti Yoga Club @ Stanford is presenting a unique offer to its students, faculty and staff: Consciousness Cooking vegetarian cooking classes. Hands-on learning of the cuisine art and more. Seats are limited. Access here for more details and register to get in.